An elevated railway line - Sky Rail- will be built in Melbourne cabetween Cranbourne and Pakenham, with the area underneath transformed into public open space, under new State Government plans. 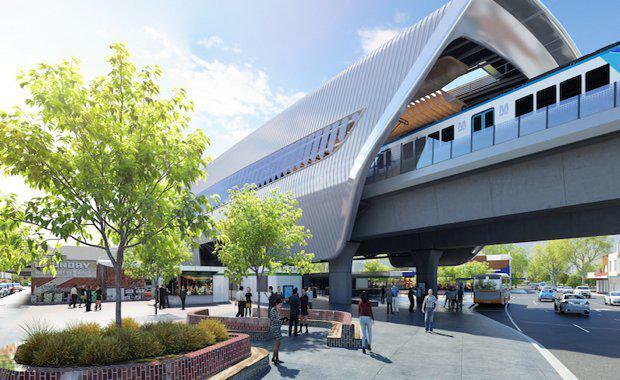 The sky rail will be built as apart of a $1.6 billion plan to remove the nine dangerous and congested level crossings between Caulfield and Dandenong. The project includes five new stations across Melbourne to be built at Carnegie, Murrumbeena, Hughesdale, Clayton and Noble Park, and upgraded signalling and power along the corridor. Minister for Public Transport Jacinta Allan said raising the sky rail line meant the "nightmare level crossings" in Melbourne could be removed with less disruption. The innovative design centres on three sections of modern elevated rail, which will create 225,000 square metres – the equivalent of 11 MCGs – of community open space for new parks, playgrounds, sporting facilities, car parking and a range of other uses that will be chosen by locals. This modern design, built over the existing Melbourne rail line will also spare passengers and drivers years of disruption during construction. The majority of the work can be completed with trains and roads running normally. Expert acoustic modelling shows that raising the line in sections will reduce rail noise at the street level. Thirty platforms along the Cranbourne Pakenham line will be lengthened to support 37 high-capacity metropolitan trains. The combined package will create space for 11,000 extra passengers in peak hour. Melbourne community consultation has been ongoing since April, with more than 1,500 pieces of feedback informing the designs including the sky rail released today. The next phase of consultation will begin immediately, with the project team out speaking to thousands of locals about the designs, and giving the community a say on what they want to use their new open space for. The Caulfield to Dandenong package will create more than 2,000 jobs and be delivered by a consortium including CPB Contractors and Lend Lease. Construction of the sky rail in Melbourne will begin this year, and be completed in 2018. SEE ALSO: Sky Rail - A Missed Opportunity?